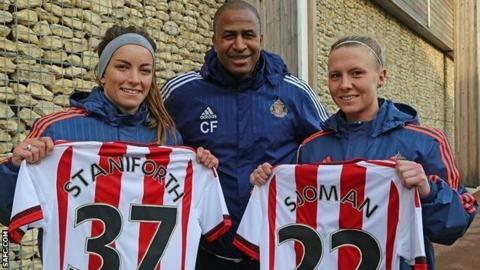 Sunderland Ladies have re-signed midfielder Lucy Staniforth from Liverpool and added defender Kylla Sjoman from Scottish side Celtic. The pair have signed two-year deals with Carlton Fairweather's WSL 1 side. Staniforth, 23, made her Lady Black Cats debut aged 16 and helped the club to the FA Womens' Premier League North title and 2009 Womens' FA Cup final. Canada international Sjoman, 28, has played in America, Germany and England prior to her last move to Glasgow. "They are two players with fantastic experience at the very top level of the game and will bring so much to our squad in terms of competition and quality," Fairweather told the club website.